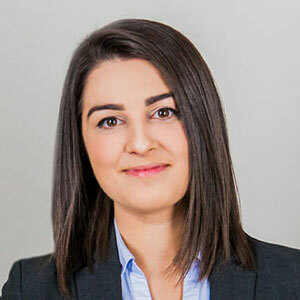 Sarah Jamshidimoghadam joined Avanessy Giordano LLP as an associate lawyer after completing her articles and first year of practice at a boutique plaintiff-side personal injury law firm in Toronto. She graduated with a law degree from the University of Ottawa in 2016. Prior to law school, she received an Honours Arts Degree from Carleton University, majoring in Law and minoring in Communications. She spent two years working as law clerk following her undergraduate studies where she developed a solid foundation for the practical and procedural workings of the law. Sarah has represented clients in the Ontario Superior Court of Justice (Civil Division and Small Claims Court) and has assisted on files before the Ontario Court of Appeal, the Licence Appeal Tribunal, the Workplace Safety and Insurance Board and the Workplace Safety and Insurance Appeals Tribunal. Sarah is dedicated to achieving justice for her clients and supporting them through the litigation process. During her time in law school, Sarah completed courses in trial advocacy and alternative dispute resolution. She has a long-standing history of community involvement and is committed to serving the community. In this regard, she volunteered at Law Help Ontario of Pro Bono Law to help low-income, self-represented clients navigate civil disputes. Sarah also served as a member of her law school’s student government and was a peer mentor to first year law students in her final year of school. Sarah is a member of the Ontario Trial Lawyers Association and The Advocates’ Society. Outside of work, Sarah enjoys playing soccer, travelling, learning to cook and spending time with her family and friends.